We all adore the Aliens Love Underpants rhymes. (Tee hee.) But what does Claire Freedman write about when it’s not pants? Believe it or not, some of her stories have no undies in them at all. But they’re still brilliantly funny – and here’s your chance to enjoy them! OK: those crazy aliens will be popping in to say hello. So don’t forget to hold onto your pants! 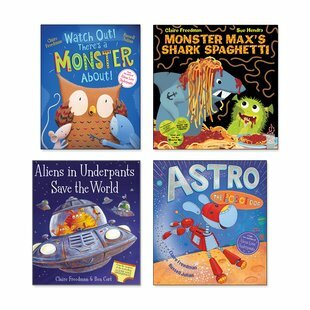 But you’ll also find hairy monsters, robotic dogs and very yucky dinners in these super-silly rhymes. Work your laughter muscles!